Best-First Search is a state space search to traverse nodes of tree-like data structures (i. e. search trees) in breadth-first manner. It is usually implemented with a priority queue instead of the FIFO of breadth-first  , to expand the most promising node of one level first. Best-first turns a uninformed breadth-first into an informed search. Since all nodes of one level must be saved until their child nodes at the next level have been generated, the space complexity and memory requirement is proportional to the number of nodes at the deepest level. 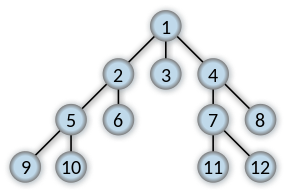 Best-first algorithms like A* are used for path finding in combinatorial search and puzzles. Iterative deepening is a technique to turn depth-first searches into best-first with the advantage space grows linear rather than exponential with increasing search depth , as applied for instance in IDA*. Alexander Reinefeld, Tony Marsland, Jonathan Schaeffer (1985). Is Best First Search Really Best? Technical Report TR 85-16, Department of Computer Science, University of Alberta. This page was last edited on 7 March 2019, at 21:00.